I have one of my computers set to backup sync once a day at 7:30am. You can see from this screen shot that it was last synced on the 23rd at 10:27 (manually). 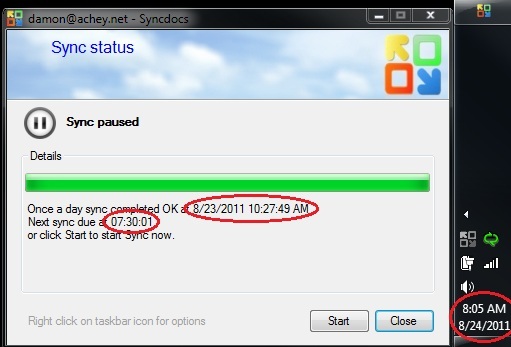 It was supposed to sync at 7:30 but it's already after 8am on the 24th. 8/18/2011 10:14:46 AM(ver. 0.61) Error log dump info done. 8/23/2011 10:20:27 AM(ver. 0.61) Error log dump info done. That's odd. A silly question: was the computer asleep at 7:30am? The machine was logged in but locked with power still on.